One striking thing about Dominion, besides its superior quality, is that it's a debut. Where many fledgling designers publish their student work, then later hope all the copies conveniently vanish in fires and earthquakes (get that 1983 Necromancer box away from me - I've paid my debt to society), Vaccarino has displayed mature talent from day one. Intrigue - which, aside from a few interesting promotional action cards like "Envoy" and "Black Market," is the earliest indication of the support line's direction - confirms his astuteness. Suppose instead that the first expansion took the game off in a radical new direction. Well, for a while all there is is the main set and the first expansion. So half the cards would be the radical new thing. It seems much better to me to have a solid base of game before veering off. 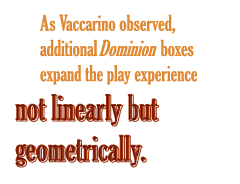 As Vaccarino observed, additional Dominion boxes expand the play experience not linearly but geometrically. Meanwhile, those hungry for "exotic" rules can find fan variants online. For instance, though Vaccarino has no plans for a solitaire version, BoardGameGeek has stepped up with Dominion solitaire rules. Fans have also coded conveniences like Zack Hiwiller's online card set constructor. There's more ahead. Vaccarino frequents the BoardGameGeek Dominion forum as donaldx. His November 2008 background article, "The Secret History of the Dominion Cards," subtly suggests that he had no less than seven expansions in development at the time of the piece's writing. And still more: According to Boardgame News, at the 2009 Spiel des Jahre press conference in Berlin, Rio Grande publisher Jay Tummelson remarked that at their first meeting, Vaccarino presented him with nearly three dozen designs. Whether these games reach print, and whether they enchant game groups as Dominion did, remains to be seen. But Dominion's success shows, whatever the economy's problems, the art of table game design is still moving forward like a card-carrying bullet train. Allen Varney, a writer and game designer in Austin, Texas, has written more than 50 articles for The Escapist. Follow him on Twitter.